Your Choice. Your Future. Act Now. This poster sample, created by Seven13 Studios, shows how the Education Matters campaign can be aimed at multiple audiences, while keeping the message the same. This photo is used courtesy of the Melrose Reading Station, a grant-funded early literacy project within Roseburg Public Schools district, which offers a place for parents and children to meet up, read and play together. Here Melrose Reading Station Director Shawna Frasier reads to her daughter and two boys who attend the Wednesday program. Roseburg Public Schools is a DCPSS partner. Our social marketing campaign aims to create a groundswell of support and buy-in that education – all education, from cradle to career – matters, is valuable and should be a lifelong pursuit that parents instill in children and communities encourage in each other. Using hometown examples and stories, our campaign will show how all stages of education build upon each other and promote all post-secondary education possibilities (career technical training, military, trade school, college and university) equally. 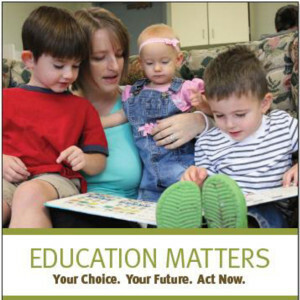 The Education Matters campaign will launch soon. See examples of how this campaign will look HERE. Paid for by a grant from the Ford Family Foundation, the DCPSS Social Marketing Work Group used data gathered from Douglas County students by Seven13 Studios. The Audience Research Report asked eight survey questions to gauge what students valued most about educational benefits and what was holding them back from pursuing post-secondary education. Education was recognized by most respondents as offering better career opportunities and experiences. But making more money as a result of having a higher degree was not a primary driver or benefit for most respondents. Students said barriers were affording post-secondary education and knowing how to get information about options. Read the full Audience Research Report HERE.